Part One: Great Commission or Great Confusion? “We tried discipleship, but it didn’t work,” said an experienced pastor to me over the phone. I didn’t know whether to cry or to scream. “Oh, yeah, we have a discipleship program. We started some small groups a couple years ago” said a younger pastor, assuring me of their church’s commitment to Great Commission ministry. to make disciples of Jesus Christ. Every week, thousands of godly, evangelical Christians experience unnecessary guilt and frustration because they never been trained how to fulfill the Great Commission. Sadly, many Christians view discipleship like an elective church class to enroll in rather than a divine command to be obeyed. This lack of Holy Spirit conviction inevitably diverts them from obedience to Christ and entraps them in an endless cycle of spiritual diversions. Others mistakenly see discipleship as merely a synonym for small group ministry (see quote # 2 above), or as a catchword for life-on-life ministry outside the church. Disciple-making is God’s command for every believer to join Him to train others to become fully-devoted followers of Christ. To fulfill Christ’s command to make disciples, we must evangelize the lost, help them identify with Jesus Christ in believer’s baptism, and train (not just teach) them to obey Christ in all things. Biblical disciple-making is not about form (such as implementing a small group ministry), but about function – how we fulfill Christ’s command to reach the entire world with His message of redemption. God’s Word presents a clear mandate (to go and make disciples) and provides a comprehensive plan for making disciples. The church must reclaim the New Testament principles of disciple-making, used so successfully by the early church, if it expects to honor Christ and fulfill His command. To do anything else, in the face of Christ’s express command, is sin. Before we consider how to fulfill the Great Commission, we must understand what Christ commanded about disciple-making. When we look at the five direct New Testament references to the Great Commission in juxtaposition, we learn some important spiritual truths that help us understand Christ’s command. Spiritual Truth #1 – The content of the gospel. Is the gospel “Jesus loves me and has a wonderful plan for my life?” or “Jesus wants me to be successful and love myself so I can maximize my God-given gifts and potential?” In Mark 16:15, we read Christ’s command to preach (or proclaim) the gospel (Mark 16:15), but it is in Luke 24:47 that the true call of the gospel is revealed, “repentance and forgiveness of sins would be proclaimed in His name.” The gospel (1 Corinthians 15:1-4) calls man to repentance and gives them the promise of complete forgiveness of their sins through Christ’s sacrifice on the cross on their behalf. Any other message is not the gospel and thus not part of Biblical discipleship. Spiritual Truth #2 – The command is to “go to the world.” The Great Commission is not fulfilled by merely inviting people to church or holding special outreach events. We must not be satisfied to merely invite the unsaved to our churches as a fulfillment of the Great Commission. We must take the gospel to the highways and byways of our communities, workplaces, and around the world to reach the lost for Christ and then we invite them to join us at church to learn all things He has commanded. Spiritual Truth #3 – The power to make disciples comes from the Holy Spirit. Two of the five Great Commission passages (Luke 24:49; Acts 1:8) emphasize the need to rely on the Holy Spirit’s power to fulfill Christ’s command. If a Christian obeys Christ’s command to make disciples, he or she will experience the Holy Spirit’s power to be a witness for Christ. 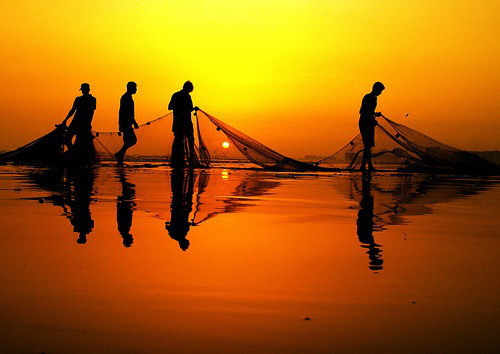 Jesus said, “Follow Me (come with me and I will show you how, not just tell you how – author’s commentary), and I will make you become fishers of men.” (Mark 1:17). Spiritual Truth #4 – The objective is to “make disciples.” Christ did not command us to make church attendees, church members, or to build church buildings. He did command us to make disciples (Matthew 28:19). While it is important to encourage church attendance and to exhort new converts to be baptized, we must never forget that our main objective as believers is to glorify God and make disciples of Jesus Christ. If we focus on anything else, we will inevitably lose sight of our goal and fail our mission. In the next article in this series, we will take a close look at the Greek word mathetes (disciple) and identify four distinguishing characteristics of a true or convicted disciple of Jesus Christ. Permission is granted to reproduce this article without change for non-commercial purposes as long as acknowledgment is given to Lamplighters International and John A. Stewart as the author.